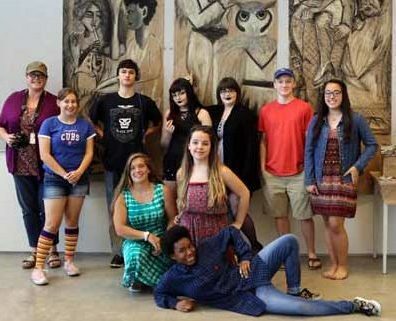 Pictured are Isis Theisen and Arissa Lancaster, from Central High School, among other students, at the Summer Drawing Program, a collaboration between the Figge and Western Illinois University. Bruce Walters, Western Illinois instructor and well-known area artist, features here a triptych drawing created by the students during his class. Over $1400 in artsBASICS scholarships were given to the following artsBASICS schools’ students, to increase their arts education in a variety of opportunities given by the following arts education partners. We applaud these students for their commitment and the partners who have provided these opportunities for our artsBASICS students, using our annual scholarships funding, provided through funds from our annual fundraiser event at the Figge Art Museum.